For the first time the City of Philadelphia and PennDOT have installed shared lane markings or sharrows on major bicycle routes in Philadelphia. Sharrows are generally installed when there is not enough width for bike lanes but are installed to remind motorist to share the road with cyclists as well advising cyclists on the most ideal lane position (outside the 4 foot wide door zone). The first corridor where the City's Streets Department installed sharrows is along Umbria, Main St and Ridge Avenue between Manayunk and the Wissahickon. 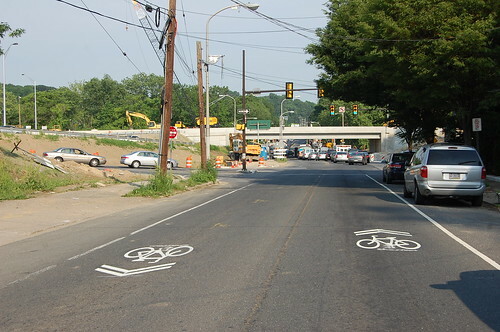 Additionally, PennDOT installed sharrows on Ridge from the Wissahickon Creek to Kelly Drive in East Falls resulting in nearly 2 miles of markings. Look for sharrows (and a few new bike lanes) on several streets in the next few weeks. If we want to geek out about first installed sharrows in the city, I think Spruce between 22nd and 23rd was the first set of sharrows. ;-)Although I suppose 1 block isn't very much. I think there's a total of 2 sharrows there. I like sharrows as a way to alert motorists on roads, however my fear is that where bike lanes could be installed, sharrows are put down because they require less retooling of the road. I was in Boston this weekend and sharrows seem to be the norm, and unfortunately the older style next to parked cars that didn't take in the risk of being doored.